When hot summertime arrives, no matter where you live, plenty of cool liquids will be needed by kids for outdoor activities and while on the go. Water bottles provide children with a fresh, clean supply of water or beverages when they are traveling in the car, out on a playing field, camping out, or riding their bikes. Reusable water bottles give kids independence in drinking liquids freely, plus having their own special bottle will encourage them to drink more, and more often. Children get dehydrated quickly because they are so active, so a water bottle is a necessity. 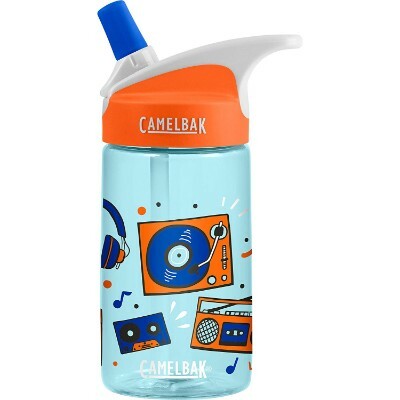 Many types and styles of water containers are on the market today, but we have compiled a fabulous list just for you of the best-rated water bottles for kids in 2019. It's important to stay hydrated! 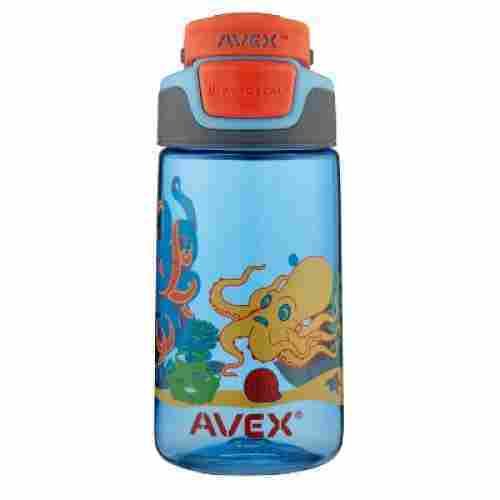 And that can be an easy task for any family with any of these awesome kids' water bottles. Enjoy browsing with our brand new buying guide format. This update narrowed the previous "Top 15" down to the new "Top 10." That means we are even more strict about which water bottles made the cut this time! Any of the water bottles that were previously part of the top 15 were researched to verify they should remain on this list. Simple Modern is a company that cares about communities because they donate 10% of their profits from the sale of their products. In addition, they offer a 90-day warranty on manufacturer defects. 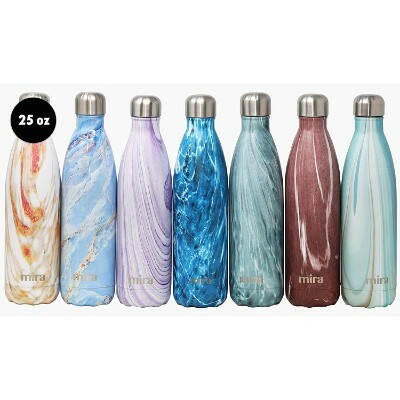 These beverage bottles come in over 40 colors and styles and four different sizes to match your thermos needs. They hold hot or cold liquids, and they are constructed of stainless steel that is resistant to rust. Some water bottles will not hold hot liquids, as well as cold ones. These beverage bottles do hold both and very well. Cozies are not needed because of the double-walled insulation that keeps liquids toasty or cool. The copper insulation adds temperature protection for any liquid you put inside, plus the lid creates a seal that is leak-proof. With cold liquids inside, the bottles will not sweat. You do not have to worry about holding the containers when hot liquids are inside either because of the fabulous insulation. Because these are tapered towards the top, they are much easier for kids to hold and handle. Wave Bottle Brushes can be bought separately as an accessory to clean your bottle properly and easily, plus they come in a variety of colors to match your bottle. 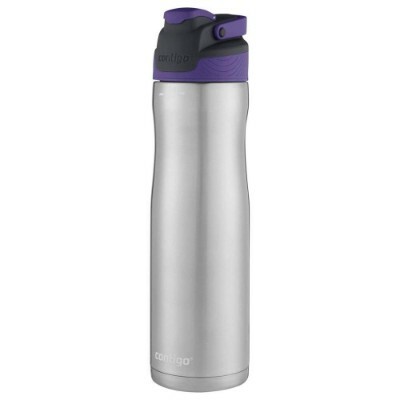 Unlike some of the other water bottles on our list, this one can also hold hot beverages instead of just cold ones. The Simple Modern Wave Water Bottle will keep your hot beverages warm for up to 5 hours and your cold beverages cold for up to 18. The bigger the bottle, the longer the bottle has the ability to keep your liquids warm or cold. Best of all when it comes to this bottle, is the price tag! It's significantly cheaper than other water bottles of this caliber. Available in 17-ounce and 25-ounce sizes, these containers are durable and slim in design. They will not break or rust, plus flavors will not stay in after washing the bottle. The great selection of vibrant colors and designs make this a charming gift for someone that likes stylish accessories. They are wonderful for boys or girls and kids or adults. Built for travel, but usable for every day too, these water bottles will keep liquids cold for twenty-four hours or hot for twelve. Even with ice inside, the container will never sweat or need a coaster. No coasters are needed when you have a water bottle like this! Double insulated material keeps this bottle from sweating. The double insulated material also can keep your hot liquids hot for 12 hours and cold liquids cold for a full 24 hours! Some containers hold smells and flavors even after cleaning, making them undesirable afterward for other liquids. These are constructed from food-grade, high-quality stainless-steel that is vacuum-insulated and double-walled. Hot or cold liquids will keep well in this high-quality item. The lid is BPA-free, Phthalates-free, and leak-proof. Coffee or milk may be put inside this bottle to keep warm or cold, which is not possible with a few other bottles on the market. For the fans of Frozen as well as other animated and movie characters, the Funtainer 12 Oz Bottle should really be a fantastic option for a kids water bottle. With an amazing vacuum insulation technology that is guaranteed to keep your kids’ drinks refreshingly cool for up to 12 hours, the Funtainer is the perfect hydration companion for today’s very active children. 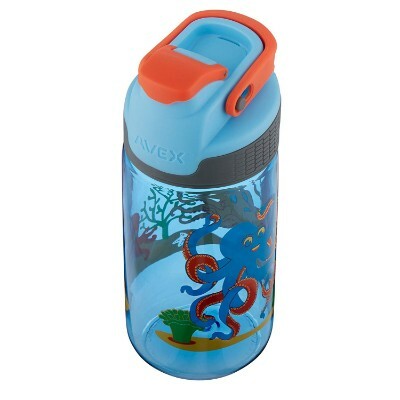 This one is an ideal water bottle for older kids due to its classic sleek design that comes in solid colors but also comes in popular themes kids love. 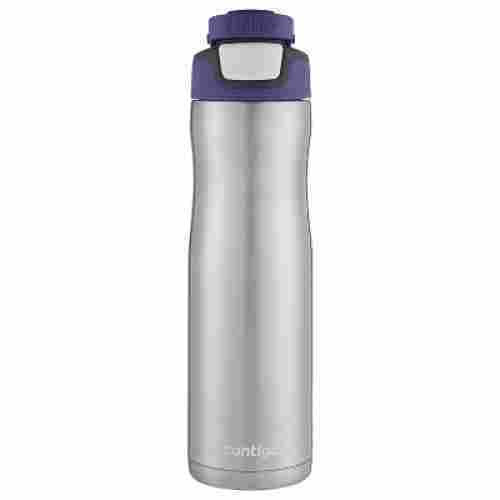 Also, the Thermos Funtainer has several features that also make it a great reusable water bottle for kids. This water bottle features a hypoallergenic pop lid feature that helps to keep the liquid inside the bottle till ready to drink. 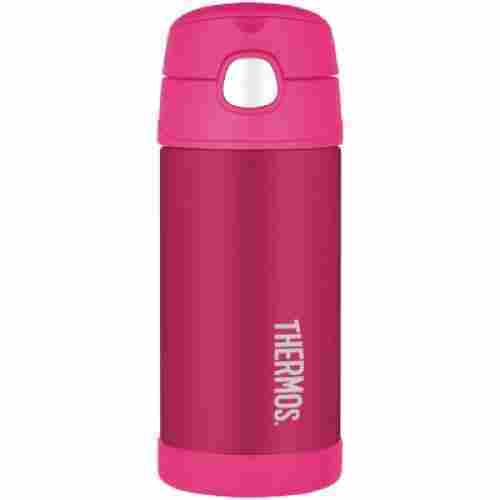 The Thermos Funtainer is also made from durable steel that lines the inside and outside. Just remember that while the Funtainer has an excellent thermal retention property, you should not put hot liquids in it. Part of its superb thermal retention abilities is its stainless steel construction both in and out. Vacuum separates the interior and exterior surfaces of the Funtainer to give it excellent retention of the temperature of the drink inside. Drinking from the Funtainer is also made ridiculously fun with a push-button mechanism that instantly pops out the straw so your child can have ready access to his or her drinks. It’s hygienic, too. And with quite a handful of designs to choose from, this is one water bottle that kids will really be proud to drink from. 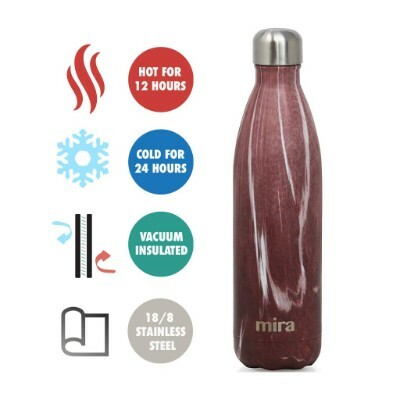 This 12 oz water bottle not only comes in 68 colors/patterns but it will ensure your cold liquids stay cold for 12 hours! While this water bottle is not recommended for hot liquids, it makes up for that in other features. It has a hygienic push button lid with pop-up straw and integrated carry handle making this bottle easy to carry and easy to drink. One of the biggest things that kids do that can seriously cut-down the life of their water bottles is biting the mouthpiece. This is especially an issue with straw-style mouthpieces as they present a rubbery temptation that is just too easy to pass up. You could resolve this issue by switching to an open-style mouthpiece but this could cause your little one to get drenched, especially if they are still learning how to drink without a lid. 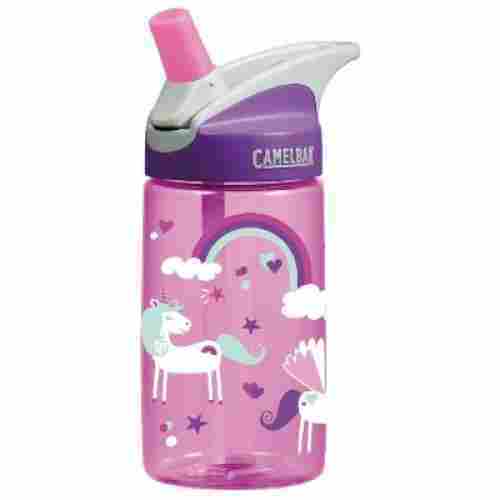 From mermaids to unicorns and watermelons to sloths, this bottle has a HUGE variety of patterns your child can choose from with this bottle! The top has a flip-up straw making it easy for little ones to drink from. The straw is nice and soft and can be replaced at any time when you're doing some basic routine maintenance too. 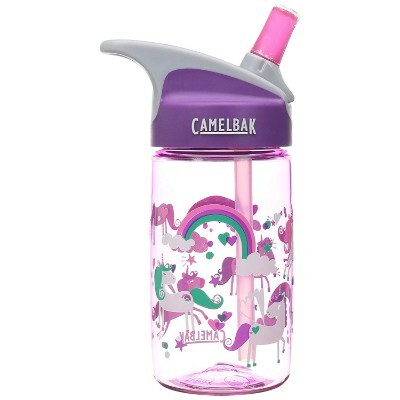 Camelbak created another alternative for the biting problem and crafted it into their Eddy Kids water bottles. These bottles feature a "bite" valve and straw-style mouthpiece. This straw is designed to be bitten! Biting forces the valve to open and allow liquid to pass through, automatically sealing after each drink to reduce dripping. The reinforced plastic can withstand the heavy pressure of teeth without breaking or splitting, making this bottle ideal for younger children or even those with special needs. Crafted from all child-safe and toxin-free materials, this water bottle is a parent’s dream. 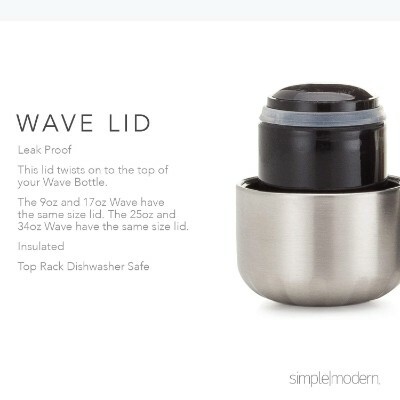 The entire bottle is dishwasher safe and designed to pull apart for quick and easy cleaning. Its small size can be easily manipulated by little fingers without spilling or leaking to encourage self-independence. It also incorporates a loop handle for easy carrying or for use with a carabiner to attach to the outside of your child’s backpack. Consisting of the high-quality Tritan material that is leak-proof, break-resistant, non-toxic, and eco-friendly, this bottle is one of the better choices for those conscious of their health and the environment. 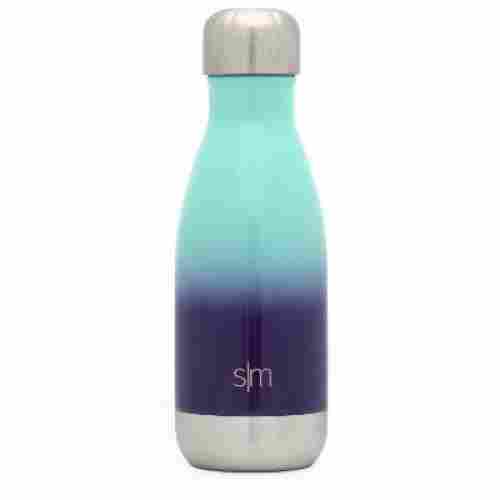 With its slim design and clip lock for security against leaks and spills, this sports water bottle or bottles will not disappoint because of the sturdy rubber gaskets in the bottles. This offer is your choice of one bottle or three. If you choose the three bottles, they will be all the same size and shape, but in an assortment of charming colors perfect for summer. You will score big time when you order these bottles if you splurge and get the 3-pack! 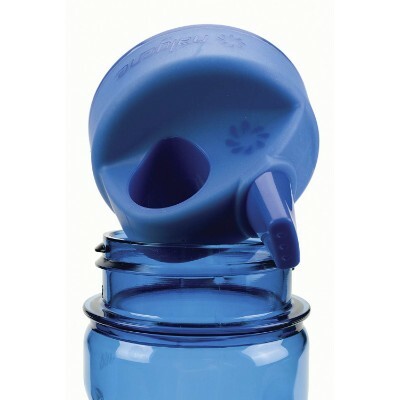 These bottles feature a clip lock to secure the lid closed as well as a rubber gasket to prevent leaks! These bottles even come with a lanyard so you can carry them with ease around your neck so your hands can be free to be used for something else! Keep the three or give one as a gift to a friend or relative. If you desire the one bottle for the same price, it comes with a matching sleeve of the same design and color. More color choices are available for the one bottle offer. These will not break and are dishwasher safe. Holding up to thirty ounces of liquid, the bottles are BPA-free and a health-conscious choice for great living. A lanyard is included with the bottles to make traveling and carrying very easy and accessible. If you need a last-minute gift for the sports-inclined person, these bottles would be just perfect. 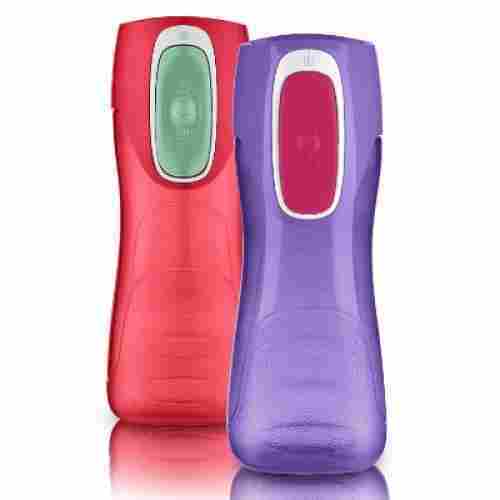 Contigo has a marvelous product with these Autoseal water bottles for kids. They permit one-hand drinking for children or adults. There are no lids that children must keep up with or try to put back on correctly. When you look at this bottle, its unique shape, and style will keep your attention and have you smiling from ear to ear. You can buy these 14oz bottles in 2-packs or 3-packs which is a great way to get a few good bottles without spending a ton of money. The greatest feature these bottles have would be the Autoseal Lid feature, which prevents any spills or leaks which is HUGE for little ones just starting to get used to using something other than a bottle or sippy cup. Just press, drink, and release. Even three-year-olds can use these bottles effectively and easily. They are wonderful for them to use in daycare, outside for events and activities, or on the go in the car. This item is two fourteen-ounce bottles that are different colors. There are several color scheme choices to pick from, and the colors are bold and vibrant. They are the ideal colors for summer! Little hands can grip these bottles well, and they are easy to clean. Made with 100% BPA-free materials, these containers will fit most cup holders. They can be washed in the dishwasher and are covered with a lifetime guarantee. The push-button on the top of this container allows very young children the ability to drink from it without spills or leaks. The button is pressed to drink and then let go for closure. It is that simple. If you’re looking for a kids water bottle that can be easily held even by a toddler, then the Grip-N-Gulp Water Bottle is what you should really get. The fully integrated handle on the rubberized lid of the Grip-N-Gulp makes it super easy to attach to almost any strap, belt, carabiner, or any other hook attachment that your child has in his or her personal belongings like a backpack, tummy bag, and even a sling bag. 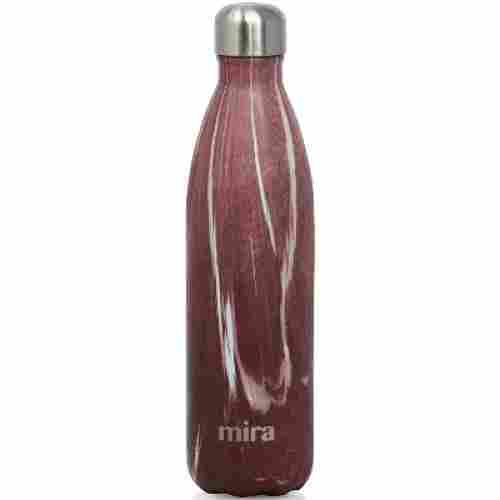 Available in 22 different colors and designs, this 12 oz bottle is BPA Free, spillproof so you can fill it with grape juice without worry that it could stain if dropped or knocked over, and has an indented profile making it easy for a toddler to grip and hold onto. As a bonus, it is also dishwasher safe! Just insert a strap into the Grip-N-Gulp’s wide handle ring and your kid instantly has his or her own drinking station. The Grip-N-Gulp also features superior threading that, when combined with its engineered lid, helps ensure excellent leak- and spill- proofing. One thing that parents love about the Grip-N-Gulp is that the canister itself has been designed with side indents making them easy to grip even by the small hands of toddlers. The Grip-N-Gulp truly is the ideal reusable water bottle for kids. The Grip-N-Gulp is so easy to handle that even a toddler could be able to hold it securely. Made from durable non-toxic plastic it is also built to last and to take hard knocks. 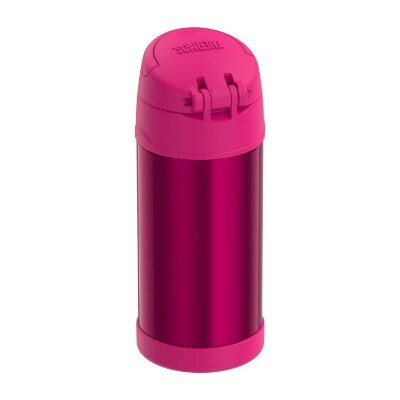 It also has features such as a rubberized lid, with leak-proof protection. 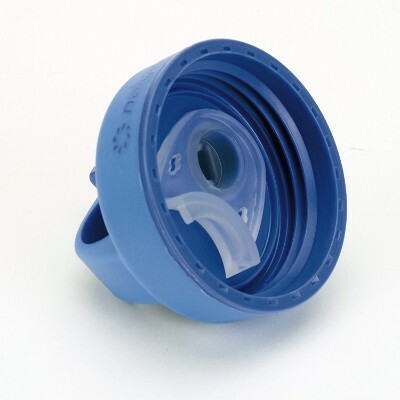 The Grip-N-Gulp has a plastic mouthpiece that’s made of premium quality Eastman Tritan co-polyester which has become the standard for plastic drinking systems. 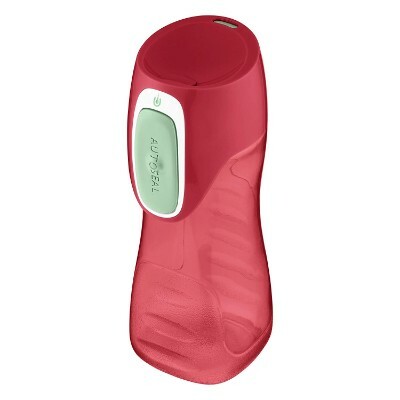 It’s durable and resists ugly stains, odors, and nasty residues. As such, it gives you superb safety springing from the absence of any harmful chemicals like BPA which can leach into the inner surfaces of the bottle. Elegant. Stylish. Sleek. These are the words that can best describe the Kid’s Auto seal Freeride Water Bottle. Available in two different drinking mechanisms, the Freeride boasts of an autoseal technology that guarantees no leaks and no spills. These bottles have 2 different types of lids for you to choose from when ordering. 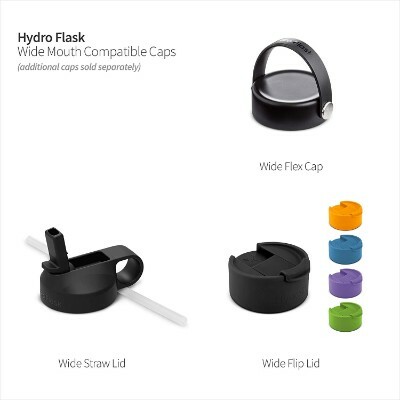 The flip lid flips open to reveal a straw for easy sipping. There is also a second type of lid called the sip lid and that one just flips open to reveal a slot similar to a coffee lid from a gas station for you to drink from. The stylish design and superb spill-proofing technology of the Freeride make it one of the best kids water bottle systems we have in the market today. Even if your kid will be taking the Freeride to his soccer game or even to her swimming or ballet lessons, there’s just no way the Freeride will be spilling out its contents. This makes sure that your child will have ready access to a safe and refreshing drink. The design of the Freeride doesn’t disappoint either as it comes with a variety of stylish graphics to choose from. And we did mention about the Freeride’s two variants. One integrates a sip id while another one incorporates a flip lid design. Whichever design you choose for your kid, you can be sure that he or she will have a superb drinking experience in the straw-less interface of the Freeride. The lid also features a fully rubberized ring to provide an excellent grip. As if the clip-on handle that’s been integrated in the design is not enough. The Auto Seal Freeride water bottle can make it easy for kids to take their favorite liquids along with them. This one is made out of non-toxic Tritan plastic. It also has a revolutionary lid that features autoseal technology. This feature makes this the ideal reusable water bottle won’t leak or spill. As our children start to grow up, it seems like each weekday becomes shorter and shorter. Between school, homework, extra-curricular activities, family time, appointments, and the inevitable ton of other things that fill your everyday schedule, finding time to stay properly hydrated can be difficult. 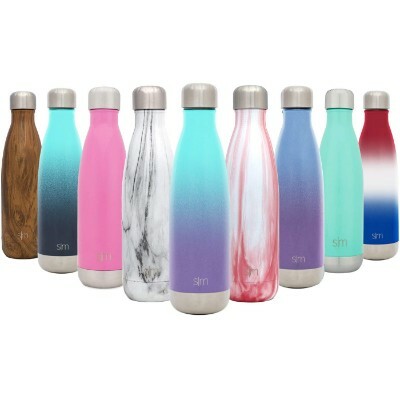 Besides the fact that these water bottles come in 8 awesome colors, what is even more awesome is that you can count on your water to stay cool in this bottle for up to 28 hours! While Contigo doesn't recommend storing hot beverages or carbonated ones in their sleek water bottle design, anything non-carbonated such as water, flavored water, juice, and sports drinks are perfect for this water bottle! 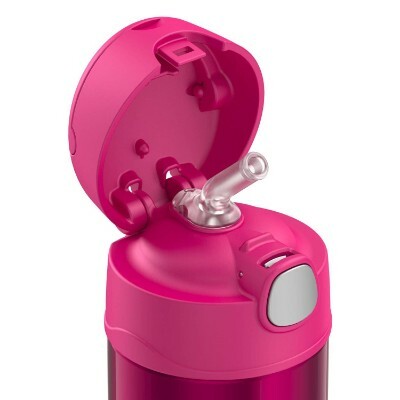 The auto-seal feature means that as soon as your done drinking, the top is being sealed so that your water will stay cold for a full 28 hours! Often, you may find yourself putting your little one’s lunch together at 8 a.m. when you will not see them again until 4 or 5 in the evening. The Contigo AUTOSEAL Chill can provide your child with refreshing water and more throughout the entire day, so that's one less worry for you. This stainless steel water bottle has been specifically designed using Thermalock insulation to keep your kid’s drinks cooler, longer. The double-walled style prevents heat from entering or exiting the bottle throughout the day. Whether your little one is drinking it with their lunch or wolfing it down during soccer practice after school, the liquid inside will still be cold and icy up to 28 hours later. Autoseal technology is used in this bottle to automatically stop water from flowing between sips. 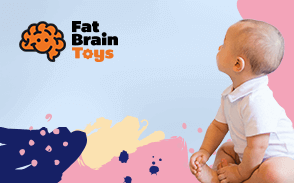 Press the ergonomically placed button, positioned in such a way that your child can operate it with one hand, and the valve opens allowing water to pass. This instant seal prevents accidental leaks while the bottle is inside your child’s backpack or pocket. A carry handle is conveniently placed on top and is thin enough to utilize with a carabiner to attach the bottle to a bicycle, purse, or even the belt loop of your kid’s pants. This is the perfect water bottle for hiking, camping, or rock climbing because it holds up to 32 ounces of liquid and it has a loop to clip to bags and packs. It is made of food-grade stainless steel, plus the bottle is vacuum-insulated and doubled-walled for maintaining optimum temperatures. Hydro Flask is the first bottle on our list so far that has the unique powder coating on the outside of the bottle. The powder coat finish makes the bottle easier to grip and hold onto as well as keeping the condensation inside the bottle instead of on the outside, meaning your bottle won't sweat and leave rings on whatever surface its sitting on. 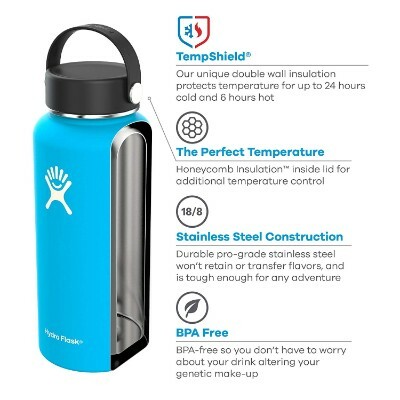 This bottle also is able to hold cold or hot drinks, keeping cold drinks cold for 24 full hours and hot drinks warm for up to 6. 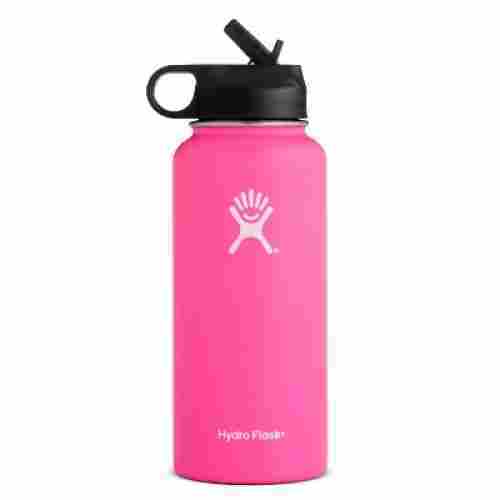 The Hydro Flask also has a ring attached to the lid that can be used to carry it around or to just clip it to your backpack on your way to the gym. The container has a wide mouth and is easy to handle with its trim design. The powder covering provides a solid grip, and cold liquids will not make the bottle sweat. 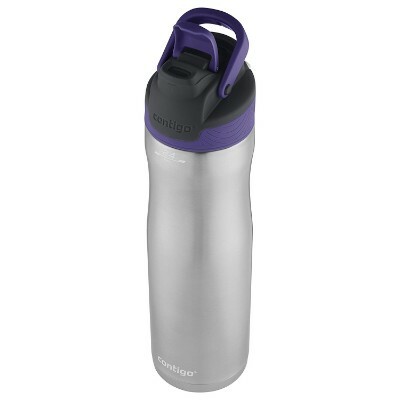 This bottle is great for hot or cold beverages, plus it fits most vehicle cup, holders. When you need a water bottle that can hold up to four cups of liquid and keep the desired temperature for hours, get this Hydro bottle as part of your gear. The length of time that liquids can be kept hot or cold with this bottle is amazing! Hot liquids stay hot for six hours, and cold liquids stay that way for as many as 24 hours. Of course, it helps to warm or chill the container first before putting in liquids. 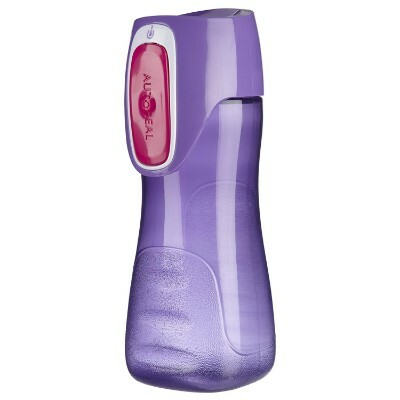 Many different colors are available for this bottle that is made of BPA-free plastic. The manufacturer offers a lifetime warranty on this product, and the lid and straw combo is compatible with other Hydro products. or a kid being told to take a reusable water bottle when they go to school or when they go participate in outdoor activities or even have them use one around the house may seem to a kid like being told the eat their vegetables. So, it’s also important for a reusable water bottle to look fun, maybe with their favorite superhero or cartoon character, which could be an appealing feature. Another appealing feature could be fun bright colors. A reusable water bottle for kids needs to be able to grab the child’s attention, in order to get them to actually use it. This is another important element to a reusable water bottle for kids. The bottle needs to have a lid that will fit tightly to secure the liquid without any leaking occurring. This can be essential to ensure that no fluid happens to spill out inside of lunchboxes or backpacks. The reusable bottle also needs to have a straw or drinking spout that works. There are also other important features such as a handle that the child can grab and having the bottle be compact enough but also hold enough ounces of fluid. Reusable water bottles for kids as the ones listed above are made to be safe for kids use. This includes having a strong outer exterior to withstand anything. This would include being knocked around or accidentally dropped. Then there is how the reusable water bottle was made which can also bring about concerns. In recent years there has been a rising concern about chemicals that are used in certain plastics. 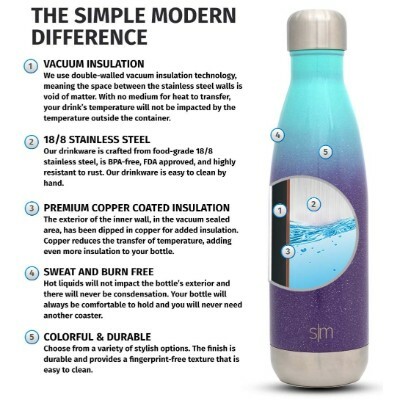 So, in finding a reusable water bottle, a parent wants to find one that will be free of BPA and even BPS chemicals, both of which have been linked to health problems in young children. Millions of gallons of bottled water are being sold all over the world every day. There is so much hype to it that many people now consider it as being the safest way to drink. And if we really love our children, then we should care enough to give them only the safest water to drink. Unfortunately, studies now show that bottled water is not any safer than the water coming out of your faucet, especially if it has also been distributed by a water utility. Both undergo the same filtration process as well as chemical treatments to render microorganisms and other substances present in water harmless. And here’s one of the greatest drawbacks for using bottled water. We are contributing to environmental degradation for every plastic bottle that we don’t recycle. And even if these bottles were to be recycled, the process itself will require tremendous energy in which fossil fuels will be used to run the operation. With or without the recycling of plastic bottles, the impact on the environment can still be substantial. Another issue that is plaguing the bottled water industry is the use of harmful chemicals like phthalates and BPA in the manufacture of plastic bottles. These substances are known to produce a variety of health effects particularly those in the brain development of fetuses, infants, toddlers, and preschoolers. Their behavior may also be affected by these substances. Believe it or not, giving a child a reusable water bottle also can teach them about taking care of their health. By understanding the responsibility of using the water bottle when they are thirsty or overheated, that will teach them a lesson in taking care of themselves. So a reusable water bottle is actually a good lesson in promoting good health in kids. Also, if a child is taught the importance of maintaining the bottle or even how to clean it, they are learning another important lesson in responsibility as well. One of the most important parameters we had to consider in our choice of the top 15 kiddie drinking systems is the safety of the materials that were used in the manufacture of the product. This was a very important consideration since the safety issue that is inherent in bottled water is something to avoid. Now, if these issues also exist in the products that we have listed, then what’s the point? We must be certain that the drinking vessels we have shared with you don’t contain any harmful chemicals that can leach into the liquid H2O such as BPA, phthalates, and PVC just to name a few. We had to look for indicators of strict adherence and compliance to regulatory policies and guidelines. If certifications from recognized agencies exist, then we factored these in. The different features of these products also were examined. Primarily, we focused on the functionality of these features. If the product says it is able to retain the temperature of any liquid filled into the canister, then it must be able to do it exceptionally well. If a drinking system comes with leak-proof technology that has been really proven to work, then we included this, too. Every published feature was scrutinized for its functionality. Otherwise, if it’s only there for aesthetic reasons, we removed it from our shortlist. 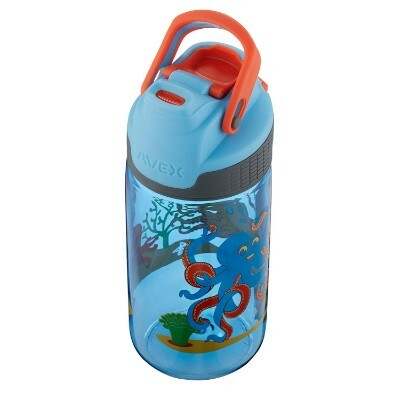 Customer feedback was also given weight in our search for the best water bottles for kids. We know how much you value the opinion and experiences of others so we took the liberty of reading through the hundreds of customer reviews and comments to identify recurring themes. This allowed us to develop a better understanding of the overall value of the product. Certainly, this gave us the impetus to finalize our draft and come up with the 15 most amazing and best water bottles for kids. q: Is it necessary to invest in a reusable water bottle for my kid? Some parents may feel that a reusable water bottle may not be necessary for their child, after all, there are drinking fountains at schools and other beverages. However, kids are more prone to dehydration than adults because they don’t stop to think about drinking necessary fluids to replenish their bodies. This can especially be an issue during the hot summer months. One thing to keep in mind is to ask yourself how active is your child. If they are involved in sports, if they love to go out bicycling with their friends or just enjoy outdoor activities than it is definitely essential to make sure they get plenty of fluid and a reusable water bottle for kids will certainly help. q: Which beverages are ideal for a kid’s reusable water bottle? Well, as far as beneficial beverages go, nothing can beat good old-fashioned water. However, there could also be times when a parent may also choose to give their child a favorite juice or Kool-Aid. Sports drinks are also a good alternative especially for athletic kids but again nothing can beat water when it comes to hydrating the body. q: Are all reusable water bottles for kids made with non-toxic materials? The reusable water bottles chosen for this list are certainly safe and non-toxic but we do understand that this is still a major concern for parents. After all, the chemical BPA found in many plastics has gone under scrutiny in recent years for being harmful to kids and women who happen to be pregnant. Even though the FDA has determined that in small does BPA isn’t harmful, the concern is still there and rightfully so. The best course of action when purchasing a reusable water for kids is to find out if it is free of BPA; usually, this will be made clear by the manufacturer as a way to show that they do care about a child’s health and well being. q: Are there any reusable water bottles for kids made of glass? Although glass is a natural substance free of any concern of toxic chemicals possibly being added such as in the case of plastics, glass does have one major flaw–it is fragile and breakable. So, because of this, glass, even though eco-friendly and healthier, is considered not a desired material to use in a reusable water bottle for kids, since it can’t sustain hard knocks. Also, broken glass can be hazardous in its own right. Because glass is fragile it is even hard to come across reusable water bottles for adults made of it, although there are some that can be found online to purchase. But again not a good option for kids since these can easily break if not properly maintained. q: How do I know that my child is getting enough water for their body weight? According to the American Academy of Pediatrics, all kids under the bodyweight of 132 pounds should drink at least 6 ounces of water each day to maintain a healthy mentality. However, during activities throughout the day, a child can lose up to half a liter of fluid each hour. So, it’s vital that the child continue to replenish their fluid up to around 5 ounces about every half hour especially during rigorous activities such as sports and in hot summer months where fluid replenishing is vital at any age. As for those kids over 132 pounds, 9 ounces of fluid along with replenishing throughout the day is necessary. q: When should the reusable water bottle be cleaned and how? It’s always a good idea every day to dump out any water or liquid that the child didn’t drink then to rinse the bottle out. The child could be taught the responsibility of doing this themselves. Every week the bottle should be thoroughly cleaned along with the lid. If you have and dishwasher and the reusable bottle has a label that says dishwasher safe, just stick it in the dishwasher, let it run through the cycle and then leave it there to dry overnight. If you don’t have a dishwasher or the reusable bottle doesn’t say dishwasher safe, it can be cleaned by hand. Place some water about halfway to the top, then add a few drops of dish soap into the bottle, place the lid back on tightly and start to shake the bottle several times. Open the bottle back up and rinse it well along with the lid under running water, then place both on a dish rack or dry towel to let them air dry overnight. Vinegar can also be used in place of dish soap. 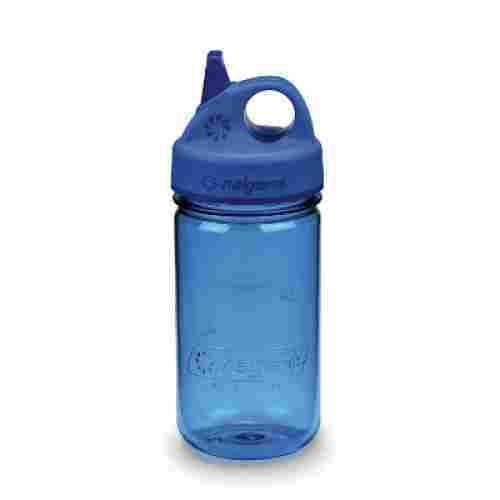 q: I have heard that reusable water bottles for kids can develop a smell or discoloration over time. Is this true? This can happen if the water bottle isn’t emptied and rinsed out each night or properly cleaned once a week. This can also happen if the water bottle is kept in a place that is damp or if the bottle is left sealed for a long period of time. In other words, this is a sign of mildew forming If this should happen, a teaspoon of bleach and baking soda diluted in water filled almost to the top of the bottle with the lid placed back on tightly than letting it sit overnight can eliminate the odor. Make sure though that the bottle is properly rinsed out after the treatment.